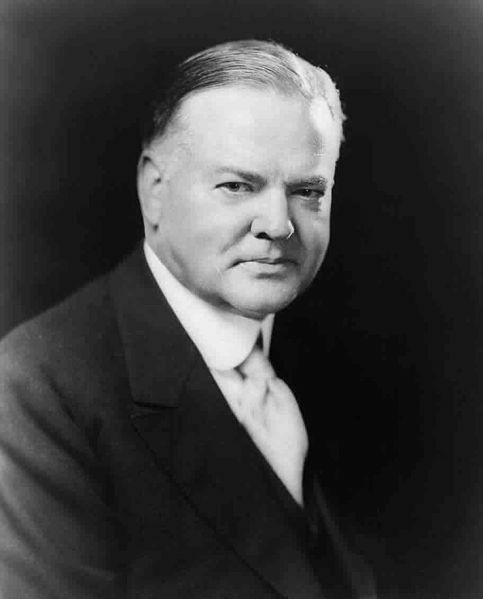 Herbert Hoover (1874-1964). Almost 7 when Billy the Kid was shot dead. Age 53 in 1928 when elected 31st President of the United States. Hoover was being small-minded here. What did he mean by "those two bastards"? Millions of people were involved. What right did Hitler have to force his will upon the people of the Soviet Union? Was it not for them to overthrow Communism on their territory rather than Hitler? Hitler had launched a war that was to kill something like 4,000 per day on the Soviet side – nothing to celebrate. Hoover had the kind of pacifist streak that dictators liked. The United States had contributed to the failure of an alliance in Europe that might have prevented war. The US had refused to be a part of any such alliance. Hoover's opinions were in accord with this refusal. In 1940 he criticized Roosevelt for "continuously sticking pins into tigers all over the world." He said that if the US did enter the European conflict, it would likely be "another Thirty Years War." I am convinced Germany will defeat Russia and dispose of that infecting center of Communism. He expected Hitler to "propose terms to the British that they will accept" and peace to follow, and he expressed hope that Hitler's proposal "may stay our hand from the trigger until these events arrive." There was the issue of Japan. Regarding US relations with Japan, Hoover complained of Roosevelt "sticking pins in a rattlesnake." He complained: "Either we leave this thing alone or we will be drawn into real trouble." He was referring to Japan's imperialist aggressions and war with China, another pacifistic attitude by Hoover that favored another aggressive authoritarian regime – more of the pacifism that dictators like. Hoover was convinced that the Roosevelt administration, by its "trade restrictions" against Japan and other "provocations," had driven the Japanese government into a corner, from which, like a rattlesnake, it had struck back at Pearl Harbor. What corner? It was up to the Japanese to see the futility of their aggressions in China and to choose to halt their effort to expand in China rather than to widen their warring to include the Netherlands, the British and the US. Hoover wrote of his concern regarding "the Communist infiltration of China." That had been a concern also of the Japanese. I was born and raised in that religious atmosphere [Quakers] which for three hundred years has never varied in its extreme devotion to peace. Yet I know that peace comes in the modern world only to those nations which are adequately prepared to defend themselves. Britain wanting help from the US to defend itself, Hoover was to describe as "brainwashing from abroad." The British, with their backs to the wall, were naturally active in brainwashing the American people for the purpose of securing our aid in the war. By far the most eminent propagandist was Prime Minister Churchill. Hoover was justified, in my opinion, in his view that the US agreement with Stalin regarding the Far East, including the occupational division of Korea, was a mistake. Hoover called the agreement the "Gotterdammerund of international honor." The book's jacket claims that Hoover "raised critical questions, many of which are still under scrutiny today: Did Franklin Roosevelt deceitfully maneuver the United States into an undeclared and unconstitutional naval war with Germany in 1941? Did he unnecessarily appease Joseph Stalin at the pivotal Tehran conference in 1943? Was Roosevelt's wartime policy of "unconditional surrender" a blunder? Did Communist agents and sympathizers in the White House, Department of State, and Department of the Treasury play a malign role in some of America's wartime decisions? The book is 900 pages.